A brand new homework series, matching the Renewed Maths Framework that will fit in with any maths scheme. Follows the blocks and units of the Renewed Maths Framework. Establish home/school links with a bank of puzzles and problems in A5 card format. 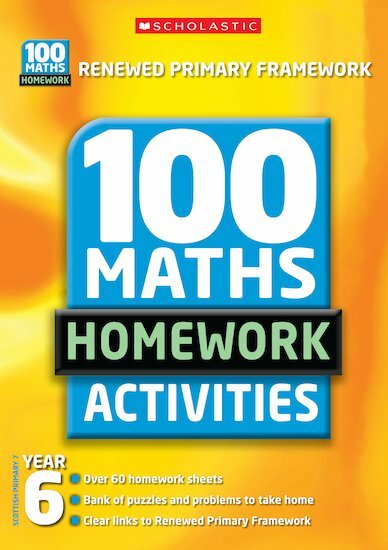 A great stand-alone resource or the perfect accompaniment to 100 Maths Framework Lessons. John Davis is an educational author and supply teacher in Bristol. He was co-author of ‘100 Maths Lessons: Year 4’ and its companion homework volume. Julie Dyer is a maths co-ordinator and acting Headteacher in Bristol. Sonia Tibbatts is a Headteacher in Bristol. She was co-author of ‘100 Maths Lessons: Year 4’ and its companion homework volume.